NEW VARIABLE ANGLE!! The Sime Climber Sprinkler is used extensively for mining, construction, and reclamation projects where a variable angle trajectory is needed for mining facilities, log mill companies and watering rock, dirt piles or hillsides. The unique, easily adjustable variable angle feature of this sprinkler allows the user to select a trajectory between 18 and 46 degrees. The Climber is also used in agriculture as well as many other types of applications. The Sime Climber is constructed from quality materials by the Sime Irrigation Company located in Northern Italy who have been building this unique sprinkler style for years. The Climber is a great alternative to impact style sprinklers when smooth and gentle performance is desired with no "impact vibration." 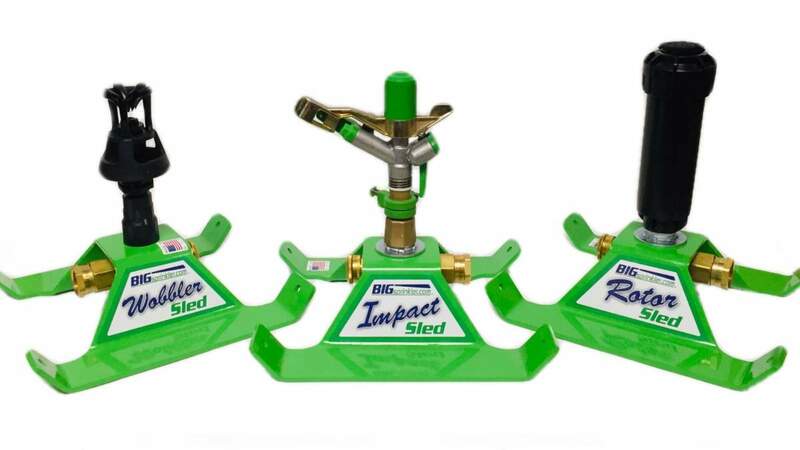 This sprinkler has a 2.5" female pipe thread connection, adjustable jet stream breaker, and allows coverages up to 440 feet in diameter with flow ranges from 170 to 600 gallons per minute! Sime Gear Drive Sprinklers are smooth in action, gentle on tender crops, and can operate on lower pressures than many big sprinklers. Continuous rotation, slow reversing speeds, and uniform water patterns make them an ideal selection for mounting on stationary gun stands, traveling irrigators, center pivots, and much more. No tools are required to change the operation from part circle to full circle; nozzles are interchangeable by hand! Flow Rate Range: 170-600 gal/min. Stationary Applications: Waste Water Applications, Coal Dust Control for Mining Facilites, Feedyard Dust Suppression, Lumber and Log Wetting at Lumber Mills, General Crop Irrigation and Wildlife Food Plots.